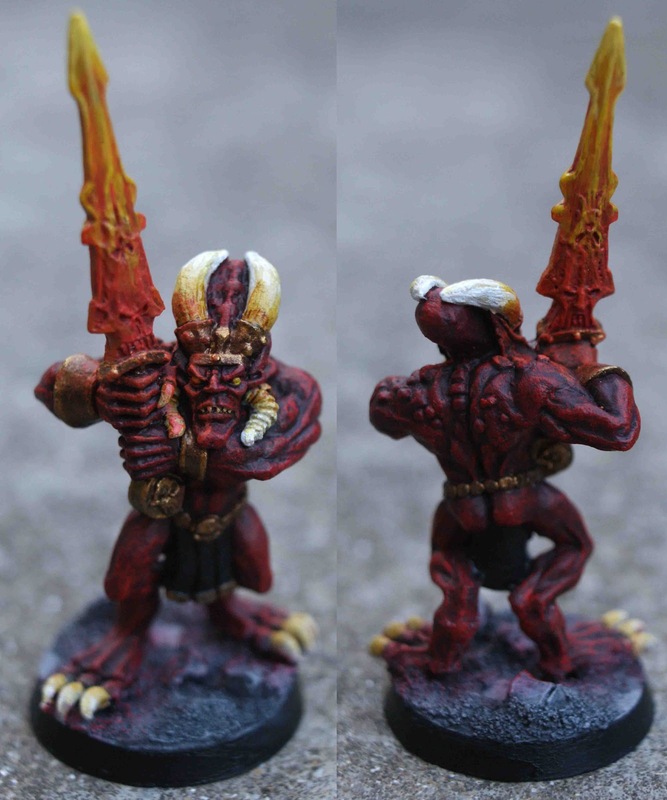 As well as the cherubim, this weekend I repainted an old Citadel Bloodletter figure. Whilst I prefer the more feral & dynamic modern Bloodletter sculpts, this miniature does have a lot of old-school charm, as well as being one of the first miniatures I ever bought, back in the day. It never got beyond a basic colour-scheme, but here it is finally looking suitably hellish, complete with my amateur attempts at light-sourcing - I think the slight glow of the hellblade & the daemon's body itself lend a bit of an otherworldy feel at least. This single Bloodletter will be useful as a nasty foe in 'Inquisimunda', or even in special Necromunda scenarios (daemons were detailed in the original Outlanders supplement). This miniature always reminds me of Ridley Scott's visually stunning Legend (1985).